Lietuva (Lietuva-gí ho͘-im: ​[liɛtuvɑ] "li-é-tu-bah"), chèng-sek choân-miâ Lietuva Kiōng-hô-kok (Lietuva-gú: Lietuvos Respublika) sī tī Tang Au-chiu ê kok-ka, sī Baltic Kok-ka 3-kok ê kî-tiong 1 kok. 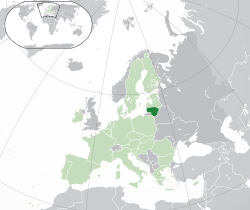 Lietuva ê pak-hong sī Latvia, tang-lâm-hong sī Belarus, lâm-hong sī Pho-lân, sai-lâm-hong sī Lō͘-se-a ê Kaliningrad Oblast. ↑ "Pradžia – OSP". stat.gov.lt. ↑ Lina Kulikauskienė (2002). Lietuvos Respublikos Konstitucija [The Constitution of the Republic of Lithuania] (ēng Lietuva-gí). Native History, CD. ISBN 9986-9216-7-8. ↑ Ernst Veser (23 September 1997). "Semi-Presidentialism-Duverger's Concept — A New Political System Model" (PDF) (ēng Eng-gí and Hôa-gí). Department of Education, School of Education, University of Cologne: 39–60. 20 August 2016 khòaⁿ--ê. Duhamel has developed the approach further: He stresses that the French construction does not correspond to either parliamentary or the presidential form of government, and then develops the distinction of 'système politique' and 'régime constitutionnel'. While the former comprises the exercise of power that results from the dominant institutional practice, the latter is the totality of the rules for the dominant institutional practice of the power. In this way, France appears as 'presidentialist system' endowed with a 'semi-presidential regime' (1983: 587). By this standard he recognizes Duverger's pléiade as semi-presidential regimes, as well as Poland, Romania, Bulgaria and Lithuania (1993: 87). ↑ Matthew Shugart Søberg (September 2005). "Semi-Presidential Systems: Dual Executive and Mixed Authority Patterns" (PDF). Graduate School of International Relations and Pacific Studies. United States: University of California, San Diego. goân-loē-iông (PDF) tī 19 August 2008 hőng khó͘-pih. 20 August 2016 khòaⁿ--ê. ↑ Matthew Søberg Shugart (December 2005). "Semi-Presidential Systems: Dual Executive And Mixed Authority Patterns". French Politics. 3 (3): 323–351. doi:10.1057/palgrave.fp.8200087. A pattern similar to the French case of compatible majorities alternating with periods of cohabitation emerged in Lithuania, where Talat-Kelpsa (2001) notes that the ability of the Lithuanian president to influence government formation and policy declined abruptly when he lost the sympathetic majority in parliament. ↑ 6.0 6.1 "Lithuania". International Monetary Fund. 2015. 6 October 2016 khòaⁿ--ê.
Chit ia̍h siāng bóe tī 2018-nî 9-goe̍h 21-ji̍t (Pài-gō͘), 12:32 ū pian-chi̍p--koè.